Perhaps you are the kind of person who desires perfection. Perhaps you long for an object that seamlessly integrates into your presentations; an object with the kind of ergonomic design that fits comfortably inside your hand, and allows you to engage fully with your audience. Then this - is the Desire2 Touch Air Mouse Presenter with Laser Pointer presented in a durable, ergonomic design. 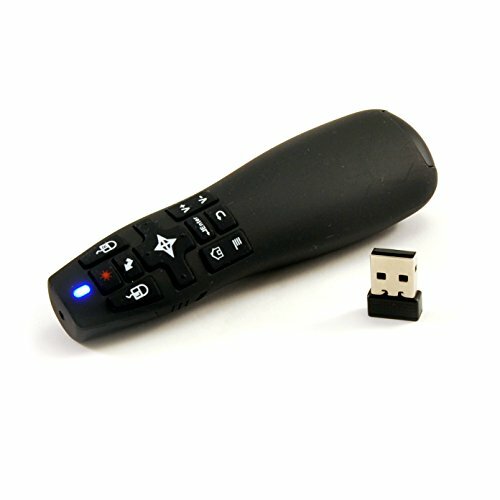 With a built-in laser pointer allowing you to interact with your audience, and a 6-axis gyro air mouse with 17 intuitive, multi-functional control buttons guiding them through your presentation, the ability to connect wirelessly via your projector, TV, or computer using the included USB 2.0 wireless receiver for full control up to 15 metres, and all with industry-leading 3 year warranty for peace of mind, the Desire2 Touch Air Mouse Presenter with Laser Pointer could be your ultimate object of desire.